The prototype Quarter-Scale Merlin used glow plug ignition, and it had relatively simple castings, two valves per cylinder, a timing belt camshaft drive, and no supercharger - just a simple model airplane carburetor stuck in the end of a log manifold. It ran on the first try. It didn't run very well, basically because of poor mixture distribution in the log manifold, but it was able to swing a scale prop at a pretty good clip. 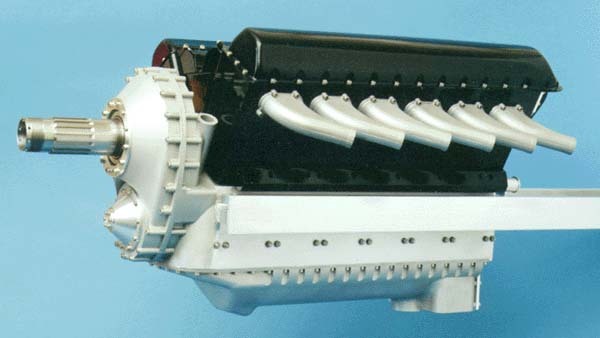 Further development would have undoubtedly improved things considerably, but it was decided to proceed with design of the 'real' version, complete with supercharger.